President Recep Tayyip Erdoğan dismissed speculation about a federal system in Turkey on Friday, saying that he strongly defends a unitary system. 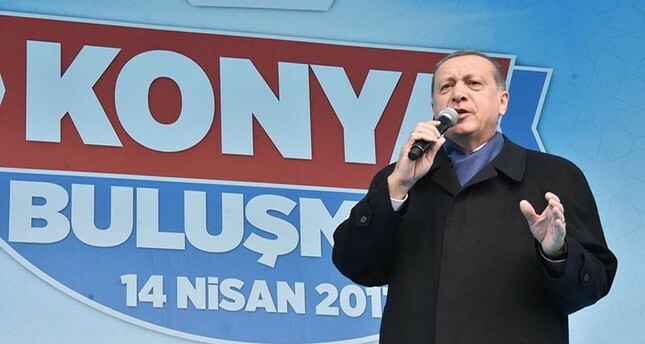 Addressing a crowd of people as part of the referendum campaign in Konya province, Erdoğan said that he is and has always been the strongest defendant of unitary system of governance. "Whether you call it a federation, provinces or whatever. None of these are on our agenda and will not be on our agenda" Erdoğan said. He continued by saying that politics in Turkey is currently being updated and that he is determined to preserve the republic within a unitary system. "We are proud of our republic" he added. Erdoğan's statements follow remarks by the Nationalist Movement Party (MHP) Chairman Devlet Bahçeli, who claimed that the government is planning to bring in a federal system following the constitutional reform referendum on April 16. On Thursday evening, Bahçeli criticized President Recep Tayyip Erdoğan's aide Şükrü Karatepe for allegedly speaking in favor of a federal system in Turkey earlier this week. After the MHP leader's remarks, some local media outlets on Friday claimed his party would vote against constitutional changes in the referendum. However, the party's deputy chief, Semih Yalçın, later clarified in a statement that Bahceli only spoke on the issue to draw the attention of the prime minister and the president. "Our leader is not a person to back down from his words," he added.